BERNINA Brand Ambassador Renae Allen of RGA Design LLC shares her technique of how to begin and end when machine quilting using different BERNINA feet on the BERNINA 550 QE! Renae’s tips also includes how to create your own stitch length and width that works best for securing your stitches. 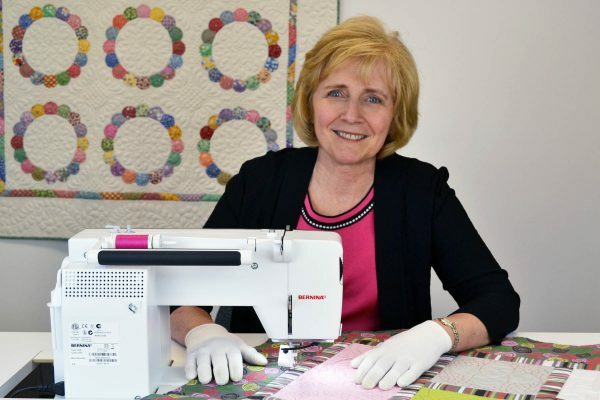 Watch this video and learn Renae’s machine quilting tip of how to secure stitches when starting and finishing your quilt. This was fantastic!!!! Thank you. Do you ever use the “securing” button? I’ve tried, but am unsure of how to use it. Thanks Lisa – I don’t use the “securing” button. I prefer the tiny stitch method for machine quilting and I usually just back stitch when I am piecing or sewing garments. Thank you. I do the first step but forget the second. When do the cutting it leaves little threads on the bottom. I will try this the next time I quilt! Why not use the stitch in the quilting stitches options that has tiny first stitches? Is that for another use? Love the new foot control on my 550QE. Extremely helpful demonstration! Thank you very much. Thank you, very helpful as I am a beginning quilter and haven’t liked the other methods that I’ve tried. This was very helpful! Many thanks. One question, do you have to reset stitch 2 every time or do you make it a favorite stitch somehow that you don’t need to keep resetting? Good question. I reset the stitch each time I start quilting because it only takes a few seconds. Amazing, what a great tip, thank you! !